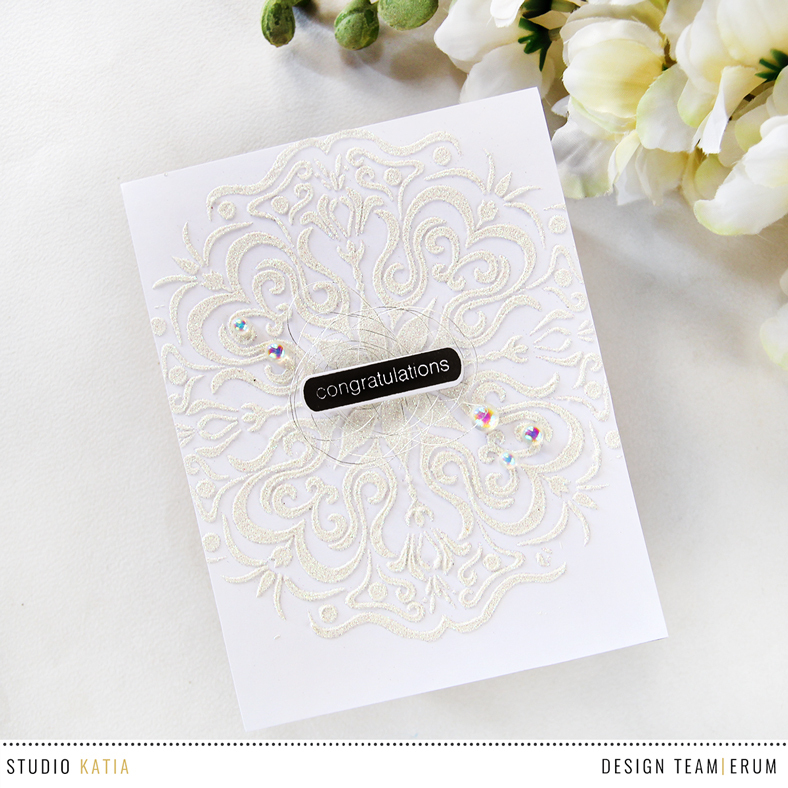 Welcome to Studio Katia March Release Blog Hop Day 1. You should have arrived here from Galachko's blog. Studio Katia is releasing 9 new Clear Stamp Sets and 5 sets of Coordinating Dies, 4 new stand alone Creative Dies, 2 new Stencils and 12 new Embellishments. The card that I have to share today will be featuring one of the new stencils, the Mandala. This is SUCH a gorgeous stencil. I will be sharing just one card today but I have a video that is not ready yet. 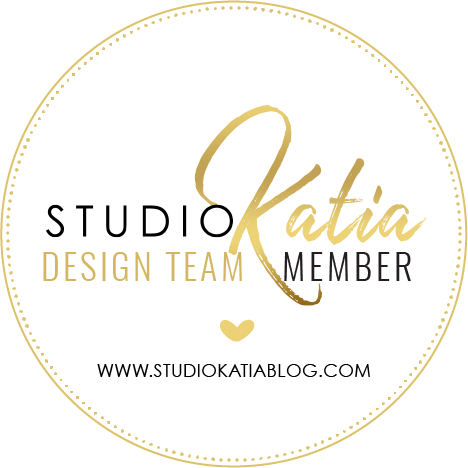 I will be sharing that on the Studio Katia blog soon. I made a very simple card. I really wanted to highlight the beautiful pattern of the stencil, so I decided to use gesso and holographic glitter. I spread the gesso and then sprinkled glitter heavily all over. Once it was dry, I popped up my sentiment which is from the Label Messages Stamp Set. I also added a bit of silver string behind the text label. In the end I adhered the beautiful, new Iridescent Bubbles. Now hop on over to Tracy's blog. I apologize if the video is not loading. This means it's still being processed and will be available shortly. Thank you! Wow! Your card is stunning! Beautiful use of the stencil. Your card is so elegant. You say this is simple; I say, simple, chic, elegant, stylish and absolutely stunning! A breath-taken-away showcase of the new stencil that has me in awe! Shopping list growing! Wow! Stunning card!!! Love it! As usual amazing card Erum. Loved the effect you have created using stencil. Oh boy I love this... so glittery! 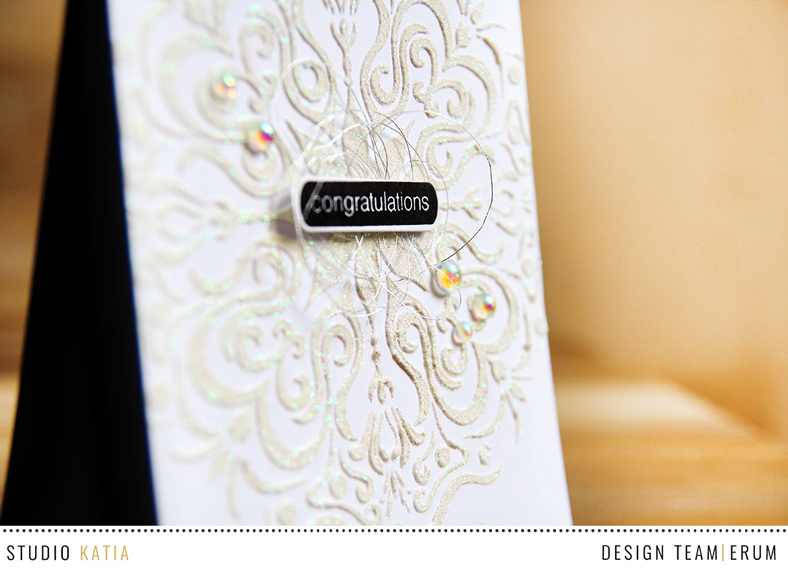 What a beautiful and elegant card that is, I love the design and sparkle! What a beautiful card - you really rocked this one! TFS! Love the tone on tone of this sparkly beauty! 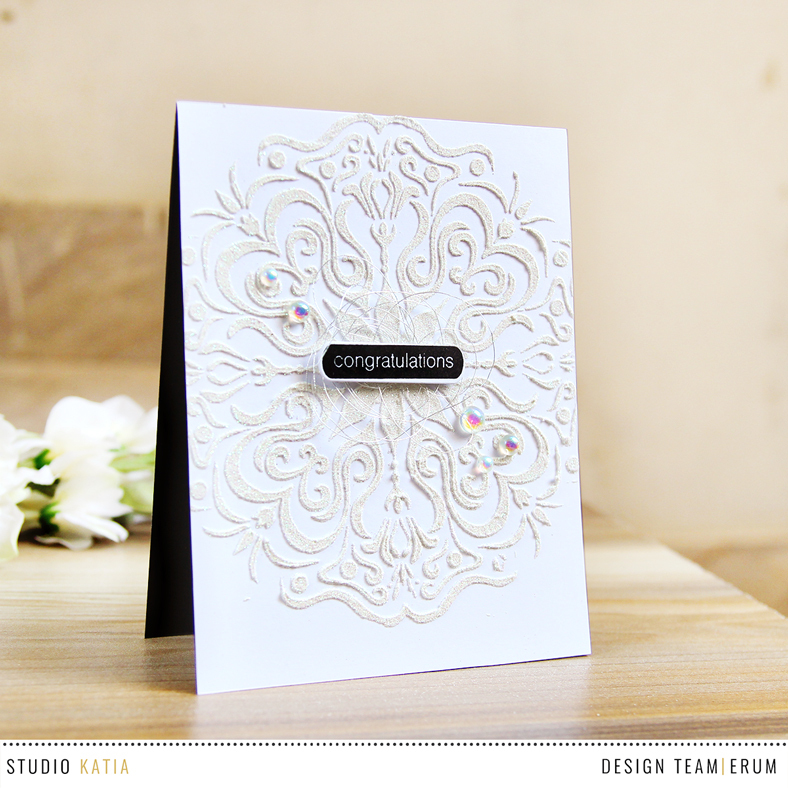 this card look so elegant and simple, love the sparkle you added with the mandala stencil. So Elegant card!! It simply beautiful!! Your card is pure elegance, Erum! I love the addition of black sentiments and iridescent drops! Hi Erum, That is a Beautiful stencil, I adore the card you made, so pretty. I'm not doing the hop, I just had to leave a comment on how beautiful your card was. That's a amazing use of the stencil Erum! 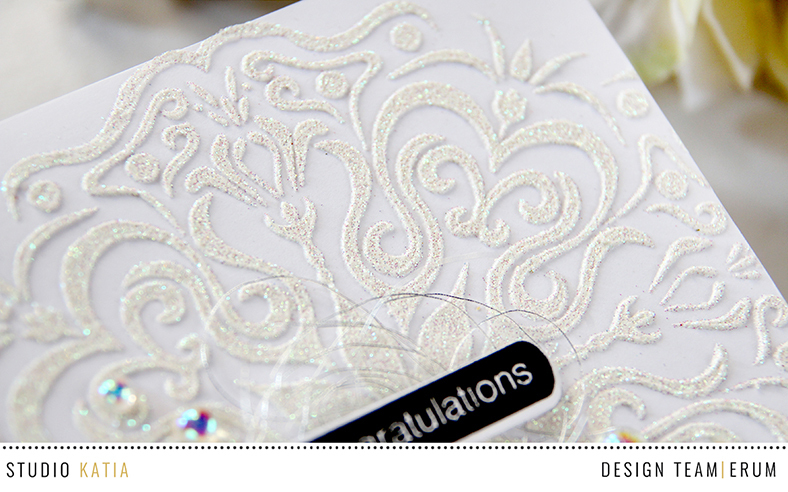 Love the sparkle and texture of your card! I LOVE that stencil! Your card is elegant. This release has so many yummy things I don't know where to begin a wish list at. Wow! This card is stunning!! Love the texture and glitter. I love your card. I’ve never seen gesso that thick before but it worked perfectly! Wow. Absolutely beautiful, simple, elegant. I really love your card thanks for sharing. What a fabulous use of the stencil. Love your wonderful card. Beautiful card! Love that stencil! This is fantastic release and what a beautiful and elegant card. Love the texture and dimension! 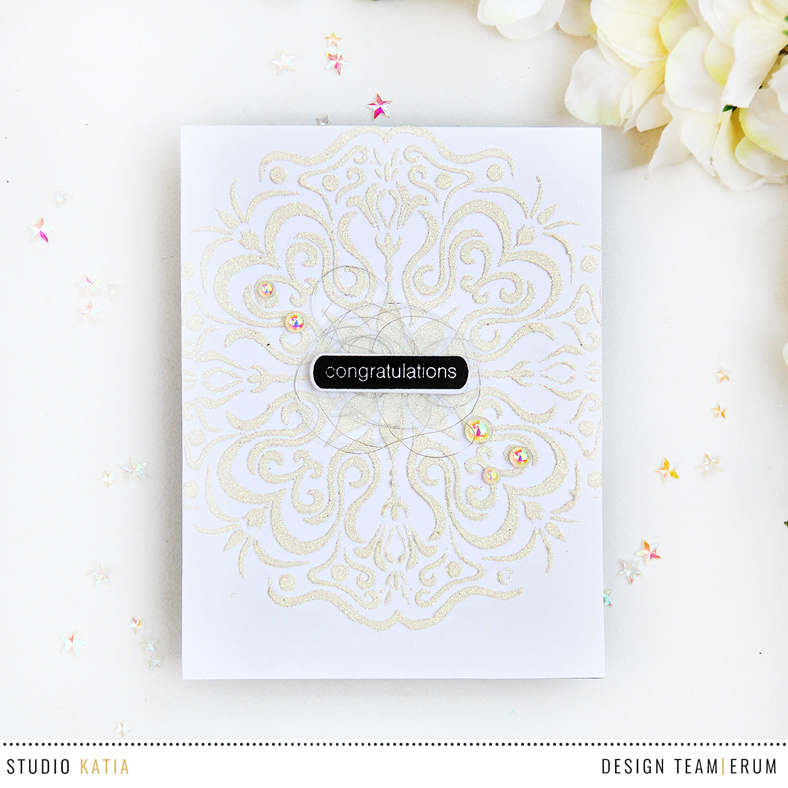 Elegant card with this lovely mandala stencil design! Love that pretty sparkle too! Wow... Simply beautiful..Love it Totally..so elegant..
Love this stencil a lot and the card is fabulous. So Elegant ! Loved the use of holographic glitter . What a very elegant card with this gorgeous stencil. Wow, the simplicity and elegance of this card is stunning. Love the texture. I agree this stencil is gorgeous. Beautiful and elegant card!! Love the tone on tone look! SO elegant and pretty! Love, love this card! Beautiful card! Very delicate looking! Wow, this is just stunning!!! Amazingly beautiful in all its sparkly glory! Wow!! Stunning card!! Love this stencil!! I really love the Mandala on your card. Such a stunning creation. Oh wow! Absolutely gorgeous - so elegant! Oh my goodness !! Your card completely blown me away !! It’s so delicate and elegant !! I would never have thought that gesso + holographic glitter would look like lace, but here we are! Especially in the first photo it looks like the old lace coverings that my grandma would put on her cabinets and tables. What a beautiful card and idea! Thanks for sharing. I love your card, is stunning! What a lovely card, Erum! The mandala is such a beautiful design! Your card is stunning! So very very pretty and elegant. I just love this stencil. Your card is so elegant and stunning! Just love this stencil. That is absolutely gorgeous! Love the glitter added into the paste! Your white on white is incredible! Altenew: Winner Build-A-Flower + New Post!